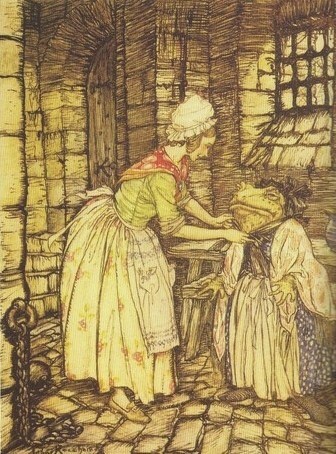 Arthur Rackham was perhaps the best known artist of “the golden age of illustration,” from 1870-1930. 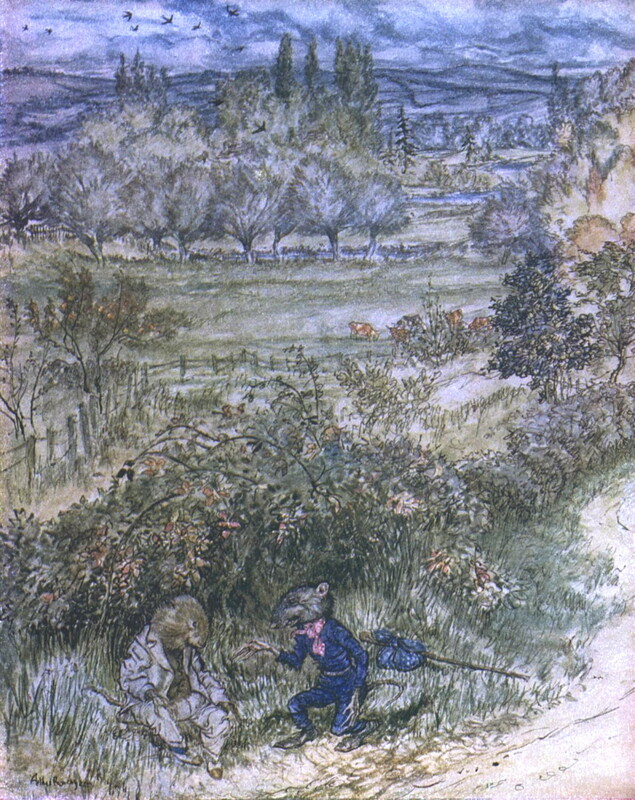 His illustrations for The Wind in the Willows were his last work, published posthumously in 1940, a year after Rackham died of cancer. I cannot think of a more auspicious partnership in the history of book illustration, though I am biased. I’m writing about The Wind in the Willows because I stopped by a blog that asked, “What is your favorite book?” This has been mine since my mother read it to me when I was four. When she finished, I begged her to start it again. I began school determined to learn to read as soon as I could so I would not have to wait on anyone else’s convenience to row up the river with Rat and Mole. One does not argue about The Wind in the Willows. The young man gives it to the girl with whom he is in love, and if she does not like it, asks her to return his letters. The older man tries it on his nephew, and alters his will accordingly. The book is a test of character. We can’t criticize it because it is criticizing us. The animals find the baby otter and the vision fades, leaving them in misery as they feel what they have lost, but then, a capricious little breeze, dancing up from the surface of the water, tossed the aspens, shook the dewy roses, and blew lightly and caressingly in their faces, and with its soft touch came instant oblivious. For this is the last best gift that the kindly demigod is careful to bestow on those to whom he has revealed himself in their helping: the gift of forgetfulness. Leset the awful remembrance should remain and grow, and overshadow mirth and pleasure, and the great haunting memory should spoil all the after-lives of little animals. The minister in the church I attended when I was young once said from the pulpit that “The Piper at the Gates of Dawn,” was the best theology he knew outside the Bible. 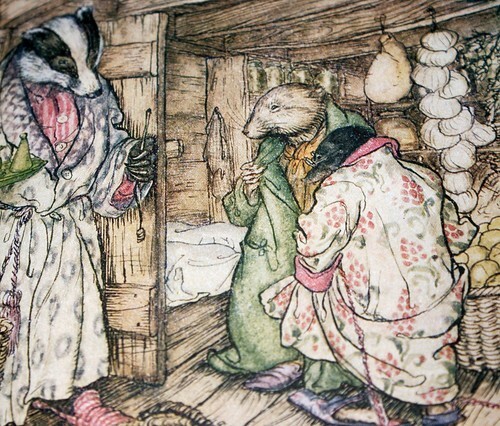 Together, Kenneth Grahame and Arthur Rackham preserved and shared a vision of an older, idyllic England of quiet lanes and riverbanks and launched it into a new century that needed such a dream, after one World War and on the eve of a second. Last time I looked for a gift for a friend, a facsimile edition was available (from Modern Library I believe). There are other nice editions like the one illustrated by Michael Hague and published in 1980, for there are more ways than one into this dream. I guess you could say I’ve been dreaming along with the great British storytellers all my life – with Rat and Mole, with Pooh and Piglet; in Middle Earth and Narnia; with King Arthur and his knights; with Welsh wizards and Irish warriors and Tam Lin in Faerie; Harry Potter is simply the latest feast from the cornucopia I first encountered when I was four years old. If you have not yet discovered the magic of The Wind in the Willows (and I don’t mean Mr. Toad’s Wild Ride @Disney) I suggest you give it a look as soon as can. In my experience (as in Bilbo’s) there is no telling where the road will take you. This entry was posted in art, Authors, Book Reviews, Characters, Novels, Writing and tagged art, authors, book reviews, fictional characters, Novels, postaweek2011, spirituality, writing. Bookmark the permalink. Beautifully expressed reasons why I love and gift this book. Thank you, and thanks for stopping by. I tried to get over to take a look at your blog, but it’s marked “private.” If that is not intended, you might want to review your security settings. I’m always curious to see what a “Wind in the Willows” lover might be up to on WordPress! Hmm. The gravatar info leads to my site, but what a surprise to find out the user name does not! Thanks for the heads up! Growing up in Melbourne, Australia, I fondly remember being taken along to live productions of The Wind in the Willows with my father at the Royal Botanic Gardens. It was such a memorable part of my childhood. To me, the characters are like old friends that lit up my life. It’s just boggling at how such a simple story can touch the lives of so many. It seems that some literature has the ability to break down all barriers and even travel across oceans and continents. How powerful the written word can be! Thanks for saying how much the book means to you. I know others who feel the same way. What a mystery it is where certain stories come from. Well, I’ve never admitted this to you, but I don’t believe I’ve ever read this book. I’ve probably read an abridged version sometime, but … Anyway, I’m definitely going to pick up a copy soon and make time to read it. Thank for posting this.